Unify your development in a single Java IDE that includes the best tools for the full stack developer. With MyEclipse, it’s simple to create a dynamic frontend along with a powerful backend—the combination that is critical to today’s enterprise. And we offer a 30-day free trial! Are you a seasoned Java EE developer? Why limit yourself to just the backend or try to produce a modern frontend with archaic tools. You have developed the business logic and infrastructure that keep the business rolling. If your frontend is underwhelming, your customers will notice. Get MyEclipse for a single solution that lets the modern enterprise developer create an impressive frontend and a powerful backend. MyEclipse is the same feature-rich Eclipse IDE that over 16,000 companies have relied on to build powerful applications for years—now with the best tools for modern web development, like Angular and TypeScript. 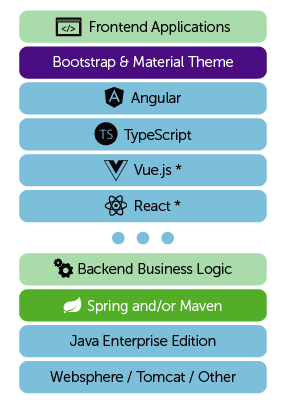 Traditional developers still get technologies they love, like Spring, Maven and JSF. 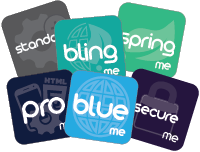 We make it simple to move to the full stack in a familiar environment without impacting current development. Technological change occurs at an exponential rate—just think of the changes you’ve seen in your lifetime. How can an organization be expected to keep up with the rapidly evolving landscape of enterprise development? That’s where we can help. We are always keeping an eye out for the latest and greatest technologies. From Java EE to the modern web, relax knowing we’ll be ready for the next big thing! And we didn’t forget about the front end. MyEclipse includes all you need to develop a dynamic front end using the latest technologies. Java developers will love how familiar web development feels in MyEclipse using TypeScript and Angular. There’s finally a way to create a dynamic frontend using object oriented development. But that’s not your only option, the possibilities for modern web development are endless when you add CodeMix* to your MyEclipse installation! If you use Spring or JSF for the frontend, no problem—we are still a superb Java EE IDE! Rest easy knowing when you are ready to move to next generation technologies, we’ll make the transition seamless. An impressive frontend means nothing without a powerful backend. Our feature-rich Java EE IDE includes time-saving features like built-in libraries and powerful editors, along with support for Spring, Maven, popular application servers, databases, and so much more. 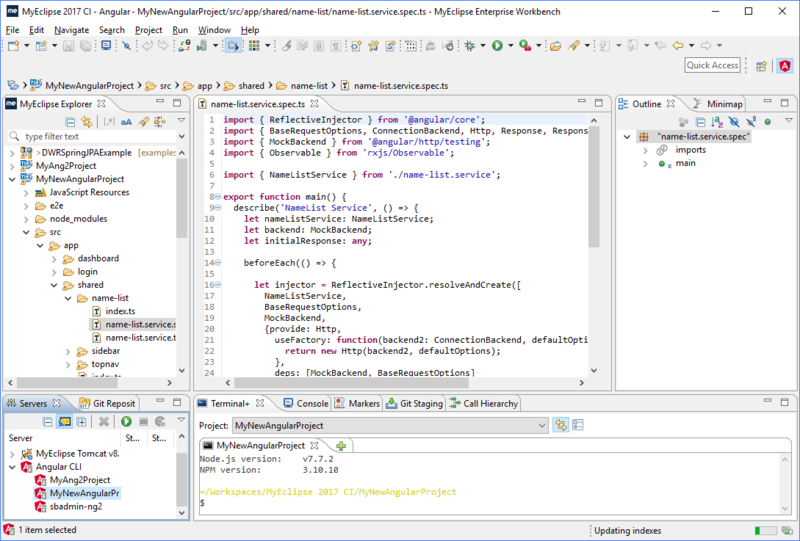 MyEclipse is the ideal IDE for full-stack enterprise development and provides the adoption path and tooling to let you easily move to emerging modern web technologies on top of your existing Java EE backend. *Access to CodeMix, the Eclipse plugin that delivers VS Code smarts and access to wide array of Code extensions, is included with your MyEclipse license. Just what you’ve been waiting for. One IDE that makes it simple to build a powerful Java EE application and a dynamic frontend using Angular and TypeScript. And best of all, it’s absolutely free to try for 30 days! So don’t just take our word for it, download MyEclipse now and see for yourself just how awesome it truly is. 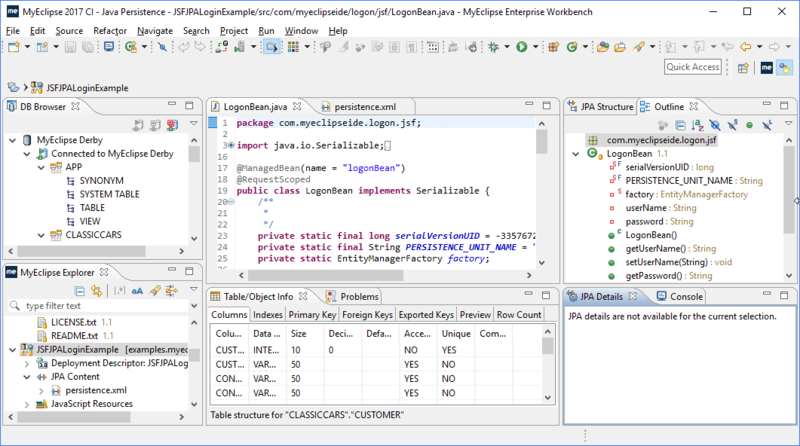 MyEclipse provides the best single-source solution for the missing pieces in Eclipse.